Little Heap Vintage: Birthday Balloons! Hey guys! Today I'm switching it up a little. This past week I posted a Sunday Snapshot, which I plan on making a weekly thing, just as a sort of check-in on what vintage-related happenings I'm up to each week. Today I'm going to reverse the order and do a Snapshot today, and finally--finally--talk about Marlene Dietrich this weekend. I'm a little bummed, as I'd hoped I could make the Marlene post coincide with my birthday today, but I need to switch for two reasons: I'm a little swamped by Dietrich research (I'll talk about why this is in the actual post), and because today provides a perfect opportunity for a vintage snapshot. Today, the balloons for the 89th Macy's Thanksgiving Day Parade are inflated! Since the parade began in 1924, it technically qualifies as vintage, and hey, who doesn't like birthday balloons? 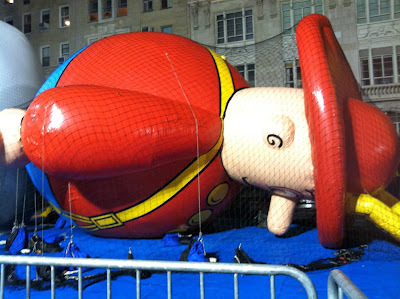 I've always loved the Macy's Thanksgiving Day Parade. Every year, I get up in time to make coffee and cinnamon rolls and watch the floats, balloons, and Broadway performers go by. I can't really explain why I structure every fourth Thursday in November around this thing, but I do, and this year is the first I've been in New York on Thanksgiving, and able to actually participate in some fashion. Now, I won't be at the parade itself tomorrow--I watch my parade like I watch my tennis: on TV, with commentary and perspective. But the balloon inflation? I'm there. 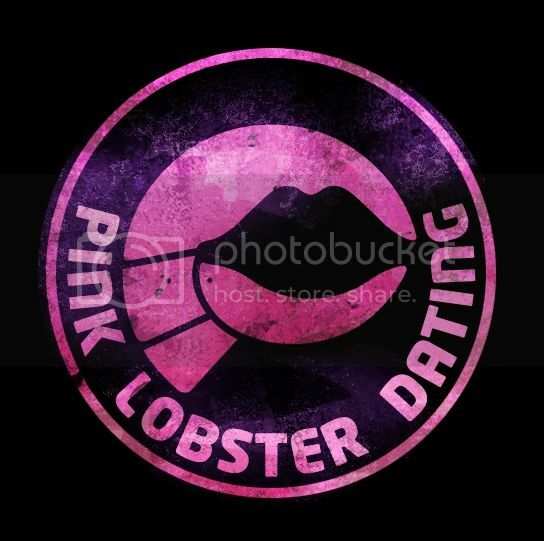 Since this is a vintage blog, first-- a little history. 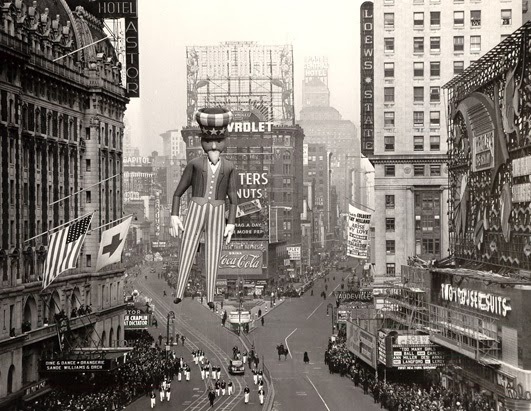 This photo is from the first Macy's Thanksgiving Day Parade (then called the Christmas Parade) in 1924. 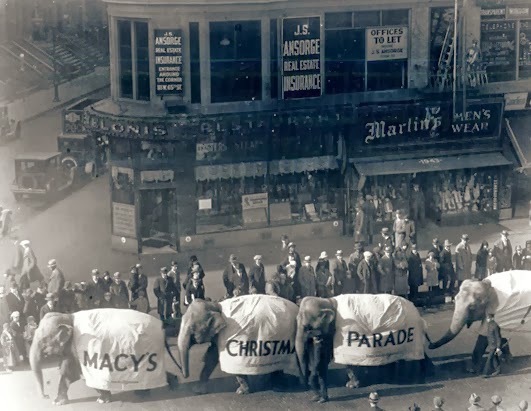 The original parade (the title's visible on the elephants!) featured zoo animals. Felix the Cat made his debut as the parade's first giant balloon in 1927. 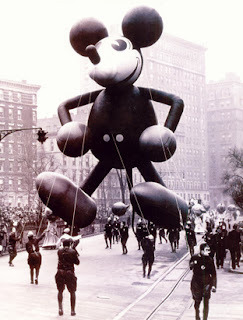 Walt Disney helped design this Mickey balloon! 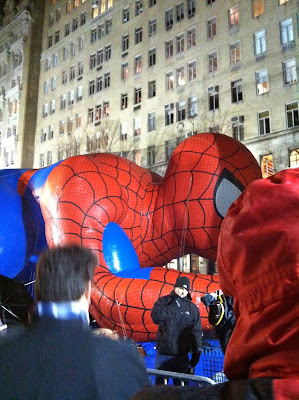 Giant balloons were introduced to the parade four years later, thanks to the recent discovery and use of helium. 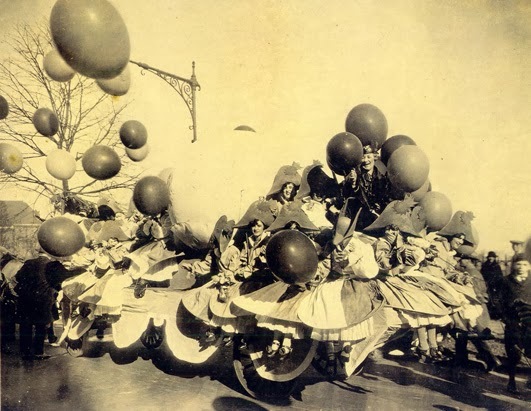 What hadn’t quite been perfected, though, was exactly how to release the helium, so after the parade, they simply released the whole kit and caboodle. The release turned into a game of sorts, as Macys sewed return labels onto the balloons and offered a monetary award for their return. But after pilot Annette Gipson tried to snag a balloon with her plane, nearly causing a fatal crash, the questionably intelligent contest came to an end. A great shot of early 1940s New York City, overseen by Uncle Sam. 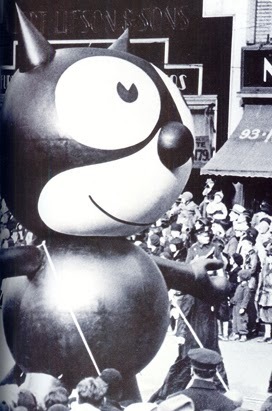 Harold the ____ is a parade tradition dating from the 1950s. Ok so this one isn't historical, but who cares? It's Kermit. Everyone loves Kermit. 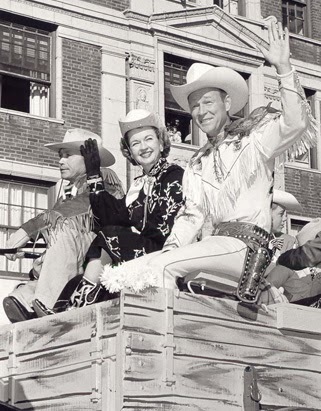 A lot has changed since the parade's early days, including a shift from horse-drawn floats used until 1939, its first televised route in 1945 after a two-year hiatus during World War II, and a downsize from 6 miles to 2.65. 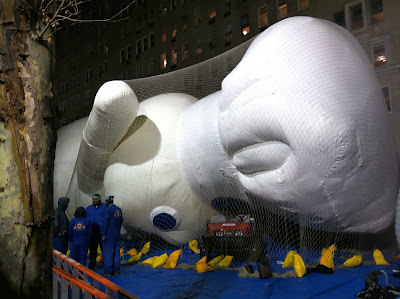 Today, five- to six-story-tall balloons are assembled in a former Tootsie Roll factory in Hoboken at least a year in advance, and are brought in to the parade’s entrance at 77th and Central Park West to be inflated the night before---which brings us to tonight! Hey! It's Harold the Policeman! Well I'm not quite as excited about this dude, but to each his/her own. Official sponsor of tomorrow morning's cinnamon rolls. Don't worry, it's not beginning to end, just the prep and start. Anyway, however you celebrate, I hope you have a fantastic Thanksgiving! --Balloon wranglers are required to weigh at least 120 pounds, and each balloon uses from 50 to 70 wranglers. --The film Miracle on 34th Street (1947) features the actual 1946 parade. 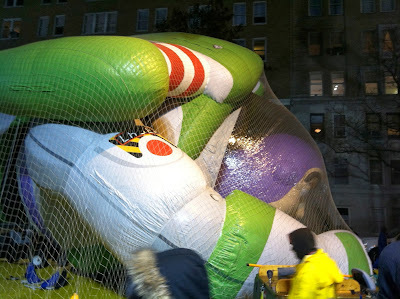 TLC's "Ultimate Guide to the Macy's Thanksgiving Day Parade!" Time's "A Brief History of the Macy's Thanksgiving Day Parade." 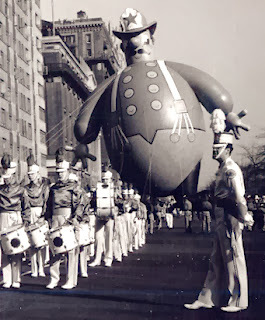 All historical photos of the parade are courtesy of Macys, Inc., sourced from this ABC article, "Macy's Thanksgiving Day Parade: A Look Back." Fun post! Those old balloons are just somehow cooler than the ones today. The one time I've seen the parade in person, Gregory Peck was the Grand Marshall. He died the next year. Thank you, that means a lot, coming from such a regularly fun blogger! Gregory Peck-- that's pretty incredible. I wish I had it in me to go to the parade itself, but this girl was not built for cold. I think the celebrity profile has also changed a lot over the years--if there was a future Gregory Peck among the floats, I just might make the trek! Hi Whitney! First of all, thanks for entering my giveaway. And welcome to New York! I hope to see you out and about on the "vintage scene" (I always feel so silly calling it that but that's what it is). Happy Thanksgiving and thanks for all the fun facts on the parade. I love it so much. How cool! 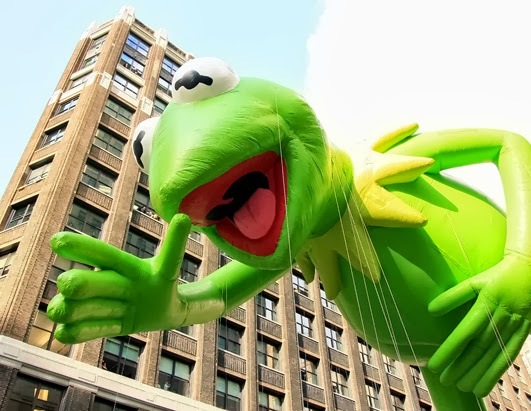 If I were to ever live in NYC, I feel I'd have to live along the parade route! I went to NYC (as well as a few other eastern states) Thanksgiving 2001, and was SO excited to attend the parade, it was incredible!